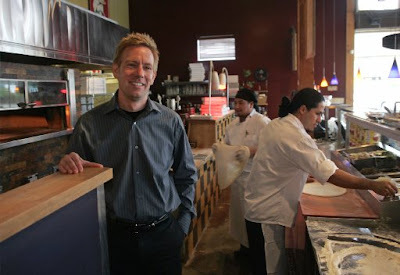 Joe Fugere, the amiable owner of Tutta Bella Neapolitan Pizzeria, has my permission to say, “Neener, neener, neener!” to the banks that turned him down in 2008 — after he attempted to secure a loan to finance his first Eastside pizzeria. While the numbers-crunchers were saying “fuggetaboutit” and calling his a “risky business,” Joe was hard at work running a first-class operation known for its Neapolitan pizza. Today he has four locations, in Columbia City, Wallingford, Westlake, and as of 2009 (“Neener, neener, neener!”) in Issaquah. Talk about a good year! Fugere (who opened his first Tutta Bella in 2004 with eight employees and now has 180 on his payroll) was handed a “Hot Concepts” award by the National Restaurant Association at year’s end, named “Full Service Operator of the Year” by the Washington Restaurant Association this spring, and this month earned cover-boy status from the magazine “Pizza Today” crowning Tutta Bella its 2010 “Independent Pizzeria of the Year” among a throng of 33,000 independents. Paying it forward, Fugere and company plan to give thanks with a pizza giveaway. Joe Fugere, left, at the original Tutta Bella in Columbia City. They’re giving it away — next week at Tutta Bella, but I was happy to pay for this one. Funnily enough, I was sitting at the counter at Tutta Bella’s Westlake location two weeks ago, watching the staff do their thing. To a one, they were friendly and efficient and as I sat waiting for my pizza, I took note of that in great appreciation. I also took a photo of these napkins, because they reminded me of something that drives me nuts, which I’ll discuss in a subsequent post — so stay tuned. At Tutta Bella, even the napkins wave the proud VNP-flag, noting the pizzeria’s Vera Pizza Napoletana certification.